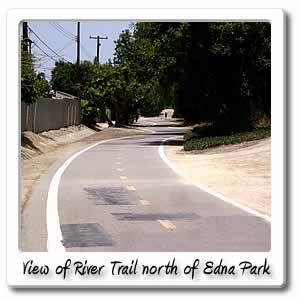 Welcome to Edna Park on the Santa Ana River bicycle trail. Heading north just after getting off the cross over bridge, you will be at Edna Park, right now the rest rooms are under construction, and they're putting in more lighting. When it is finished, it should look nice in that area. 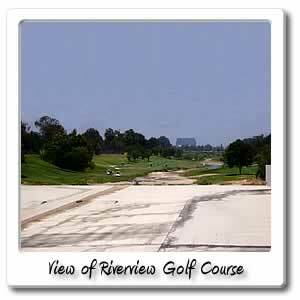 There is some parking at the back end of the park, which can be accessed from Lewis and Edna Street, which will take you to Trask Avenue, and following that out you can get to Fairview Street in Garden Grove. 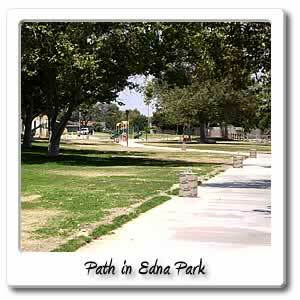 Another section of the park, can be accessed from Laird and Blueberry Street, which winds around from Seventeenth Street. 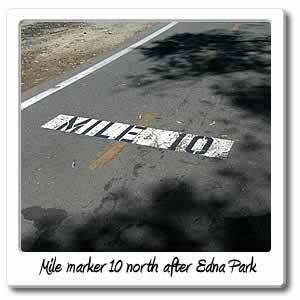 Around this part of the trail is mile marker 10.